ed. E.Laquian (1995) . Institute of Asian Research, Vancouver. Architects: Matsuzaki Wright Architects Inc. The component of this building that has piqued the most interest is unquestionably the use of composting toilets. From a water conservation perspective, the system not only saves all the water that would be used for flushing a conventional toilet, it also reduces the wastewater volume sent to the sanitary sewer system by a similar amount. This waterless toilet system enabled the building to be disconnected from the sanitary system. An objective of the continually ventilated composting toilet system is to reduce the volume of waste by up to 90%, and produce a humus-like product that is rich in nitrogen and other useful elements. Researchers and operations staff have monitored the system since installation and have found that while these toilets have achieved their water conservation objectives, the solid and liquid outputs that are produced need to be handled differently than originally intended in order to destroy potential pathogens. The exact total of energy saved from extraction, transportation, refining and production of these materials has not yet been tallied. This number is expected to be substantial as it is estimated that more than 50% of the total materials are reused or recycled. Benefits in reduced greenhouse gas emissions are important as are the savings to the earth’s limited supply of natural resources. Inside the Choi Building, spaces are so filled with daylight that the power consumption for lighting is less than half that required for typical office buildings. Offices have manual light switches; however, controls systems dim lights if adequate daylight is available or turn off lights if a room is vacant. For any building to achieve longevity and in turn be sustainable, it must be a place where people like to work or live. The occupants of the Choi Building enjoy natural daylight to work in and 100% fresh air at all times. Air quality within the building is improved through careful selection of building materials, finished products and construction practices. For example, the carpet is laid without adhesives, millwork is constructed from formaldehyde-free materials and finishes are solvent-free, low emission products. Features such as direct venting of the copy machines areas help to maintain good air quality over time. As a leader in the community, the University of British Columbia sets goals and values for the community to emulate. The C. K. Choi Building is an example of a sustainable approach in the building industry. It is rewarding to see that interest to date has come from not only the local community but also from many corners of the world. As the construction of this project is finished, it is now those who will occupy and maintain the building who will face the next challenge of this project: to set new standards in sustainable operations. Water Conservation: Significant water savings are realized through a series of features. Composting toilets installed in this project do not require water for flushing. City water is generally only required for the low flow lavatory faucets (spring loaded to further reduce waste) and kitchen sinks. Collected rain water (stored in an 8,000 gallon subsurface cistern) provides irrigation for site landscaping. Projected water usage is approximately 300 gallons per day. Waste Management: Sanitary wastewater is reduced through the use of the composting toilets. The composting toilets dramatically decrease the amount of wastewater that is sent to the sanitary sewer from the building. To manage the risks of pathogens from the composting toilets, the partially-composted contents of the toilets are periodically pumped out for separate processing off campus. The small amount of excess liquid generated is sent to the sanitary sewer. Based on experience to date, pumping out is expected to be required no more than every 18 months. In the original design, the plants and microbial community of the outdoor greywater recycling trench were used to treat greywater collected from sinks for irrigation. Because greywater from sinks is collected together with liquid from the toilets, the greywater is now also sent to the sanitary sewer. Water from the subsurface rainwater holding tank is fed to the greywater recycling trench to ensure that the plant life in the greywater trench is never left dry. Construction Waste Management: The significant amount of reused materials and products with recycled content in this building (60% of primary wood structure, 100% of exterior brick cladding) address waste management by diverting materials from landfills. In addition, a comprehensive waste management plan was implemented during construction. The site separated and recycled waste materials diverted more than one half of the waste generated on site from the landfill. Ozone-Depleting Substances: In addition to being free of CFC’s as required under provincial regulations, efforts were made on this project to select systems and products that minimize impact on the ozone layer. For example, rigid insulations are expanded boards foamed with pentane (not ozone depleting) versus extruded boards expanded with an HCFC, and natural ventilation eliminates the need for refrigerated coolants. The significant amount of reused and recycled materials in this project also greatly reduces the use of fossil fuels (otherwise required to extract, transport and process new raw materials) and thus reduces carbon dioxide emissions, the largest single component of current greenhouse gas emissions. Indoor Air Quality: Three strategies were taken to ensure good indoor air quality. Material selection was carefully reviewed. For example, all millwork is constructed from formaldehyde-free medite, all finishes are solvent-free, low VOC products, carpet is laid with a tack strip method versus adhesives. Construction sequencing was specified to ensure flushing of the building during drywall installation and finishing, painting, caulking, and during the installation of carpets. As people produce carbon dioxide and everyday operations add VOC’s to buildings, the natural ventilation system in the building was designed to provide 20 cfm per person of 100% fresh air at all times. In addition, copy machine areas are direct vented. Being continually flushed, the building does not experience peaks and valleys in lAO often found in traditional mechanized systems that operate with reduced air changes during low occupancy hours. Building Waste Management: The Choi Building incorporates a comprehensive approach to management of building waste and surface water on site. Graywater is collected in the building and directed to an exterior subsurface graywater recycling area. The graywater recycling trench contains plant material and in turn, microbial plant life known for their capacity to neutralize bacteria in the graywater. The recycled graywater is then used for site irrigation. A subsurface holding tank is incorporated for storage of rainwater collected from the roof area. This water is used for summer irrigation of the site and to ensure that the plant life in the graywater trench is never left dry. This design results in no city service connection for graywater waste from the building and no use of city water for site irrigation. The addition of composting toilets to this system allows this building to be “off grid” for sanitary waste. Environmental Management: The first step in environmental management was to enhance the ambient conditions of the existing site. Existing trees were retained for their capacity to remove C02 from the air and the shade they provide on the west elevation. The building replaces an existing parking lot and the dynamic building form capitalizes on the benefits of the different climatic conditions at each orientation. The second stey was designing a building that minimizes consumption and impact on the environment. The total operating energy savings for this project are 50% greater than what is achieved under the new Energy By-Law of Vancouver. An energy meter enables the building owner and users to monitor actual energy use in the building and make adjustments in operations as necessary. Tenant Awareness Program: Part of the commissioning process of this project includes educating users about building features and items over which they have control. For example the building has operable windows and user control over heat in work spaces. Understanding the way the stack effect for ventilation works or the operation of daylight and occupancy sensors, enables the users to participate in energy efficient operations and ensure that good IAQ is maintained. Canadian Architect, July 1996, Volume 41, No. 7, pp. 12-13. What would a sustainable would be like? Imagine a reduced and stabilized population, no more culture of consumerism, an economic framework that fully incorporates environmental impacts, significantly reduced use of resources, and the concept of waste eliminated. We are far from existing in such a world now, but we are in the early stages of a period of reappraisal and change which will extend well into the next millennium. Designing in this transitional period as society realigns itself to meet the dictates of sustainability is quite different from designing in an era in which an environmental ethic has fully matured. No architect would intentionally design a building which degrades the environment. The adverse environmental consequences of buildings derive from the collective impacts of a host of small choices and actions, each made without knowledge or concern for their aggregate effects. And design decisions are made for a society which has different priorities and is ignorant of the environmental effects. Architects cannot easily change the context in which they operate, they can and should address the issue of greater environmental responsibility and awareness. We can design environmentally responsively and responsibly today ­ it just requires different design priorities and different knowledge. Changes are already occurring within architecture, ranging from improving energy performance through to material re-use and on-site waste water treatment, which suggest considerable environments are attainable on all buildings in our time. Energy is, and will remain, central to sustainability. Natural Resources Canada’s C-2000 program has created a new benchmark in energy performance, which is 50 per cent below that of the ASHRAE/AES 90.1 standard. The program has also made tentative steps to address other environmental issues. Projects such as the “Green on the Grand” office building in Kitchener and Bentall’s office building in Richmond, British Columbia have now been completed under this program, and they meet or exceed the C-2000 requirements. The natural conditioning of building interiors is regaining acceptance. The School of Engineering and Manufacture at De Montfort University in the United Kingdom uses natural lighting, high thermal mass, natural stack ventilation and simple heating techniques to condition a wide range of different spaces, including laboratories and lecture theatres. Michael Hopkins’ design for the Inland Revenue facilities in Nottingham, England uses similar strategies and has received one of the highest performance rating in the U.K. building environmental assessment program, BREEAM. 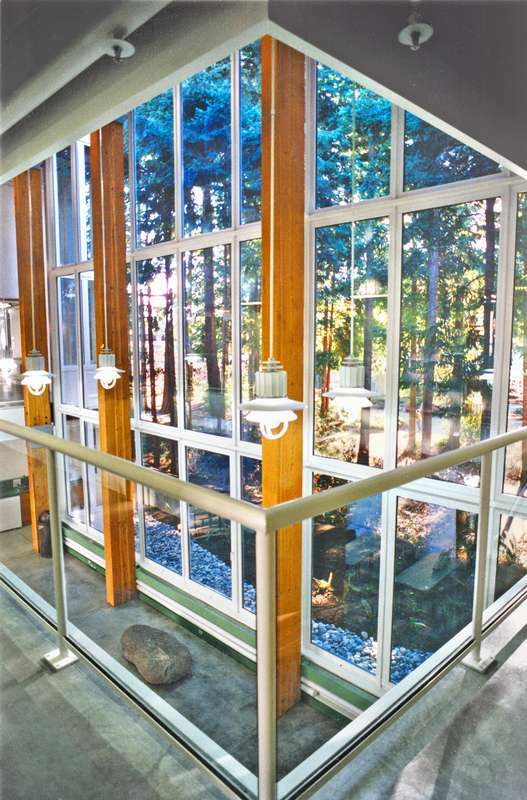 The Earth Sciences Building by Busby and Associates at the University of British Columbia, now in schematic design, also reverts back to simple, straightforward, user controls such as operable window walls and closeable insulating shutters, and wherever possible relies on natural system. The transition to sustainability will go hand in hand with a more effective use of non-renewable resources, and will eventually lead to a conversion to renewable resources. Buildings should be designed so that they can be modified to accommodate solar and other renewable energy collecting systems. And the design should take a comprehensive approach where energy is matched to the end use, and where waste heat from one process can be usefully employed in another. Whereas solar buildings of the 1970s typically focused on passive measures for space heating, and active systems for domestic hot water heating, recent projects such as the Boyne River Ecology Centre in Ontario by Douglas Pollard Architect (CA June 1994) use a carefully integrated range of strategies such as photovoltaics, wind and small scale hydro for electricity, solar collector systems for domestic hot water, and passive solar to offset winter heating. We have begun to substitute problematic materials with greener equivalents. If all the possible material substitutions were made to the way we currently design buildings, we could reduce the overall embodied energy and attendant environmental impacts of building by approximately 15%-20%. Material substitution is the most direct approach to sustainable building and one which interests both design professions and the materials industries. It is a critical first step for all architects as they enter into environmentally responsible design. Longevity is central to environmentally responsible building design, and it applies to whole buildings as well as their material parts. A building that can be adapted and reused saves building new. Its components can be recycled material or salvaged materials. The common aim throughout is to keep materials within the materials cycle as long as possible without the need for further processing. Increasing discussions about life-cycle analysis, and books such as Steward Brand’s How Buildings Learn have stimulated the growth of awareness of how important it is to think of the future implications of design decisions. One can distinguish strategies which result in immediate environmental benefits, such as reusing existing buildings and materials, from strategies where the benefits are deferred to the future, such as designing so that materials can be recovered, and with increased floor to height ratios to allow greater adaptability to other uses. Build space is a critical resource and most is currently underused. Hot-desking, where employees use any available desk rather than having their own is beginning to be explored as communications and globalization continually emphasize the need for the 24-hour office. Hot desking reduces car travel as well as demand for built space. Mixed use buildings also give opportunities for creatively intensifying the use of space. Antoine Predock’s Thousand Oaks Civic Centre in California, for example, elegantly combines such diverse uses as the city council chambers and a theatre for a local repertory company into a single space ­ civic business by day, theatre by night. Since the industrial revolution made commodities cheaply available, we have had a century or so for cultivating the notion that “more is “better.” Indeed, increased affluence has made it possible to satisfy an apparently insatiable demand for whatever we want. Design problems have typically been solved through an increased palette of materials and more sophisticated technologies. The downside, of course, has been greater use of resources and ecological degradation, and a tendency for users to be less understanding and less involved in their buildings’ operation. Reduction is the primary method of conservation. If the scale of demand for energy, materials and other resources is not managed, then other strategies such as reuse and recycling will ultimately prove irrelevant. Reducing our use of resources also means reassessing our expectation. This change in our attitudes will be an absolute requirement in the transition towards sustainability. We are beginning to witness the deliberate exclusion of traditional interior finishing materials. For example, the amount of drywall in the Strawberry Vale School in Saanich, B.C. (Patkau Architects) was reduced by limiting it to specific areas in the classrooms where it would be most effective at reflecting daylight. This strategy was consistent with a broader architectural notion that the richness of a building derives, in part, through expressing how it was built. Upgrading the existing building stock will become imperative during our transition to sustainability. And existing buildings are a vast source of future building materials. We are already seeing materials being salvaged and reused in projects like the C.K. Choi building for the Institute of Asian Research at the University of British Columbia. This project represents the most adventurous reuse of salvaged materials to date. It incorporates a heavy timber frame recovered from a previously demolished campus building, reused brick cladding and a host of other salvaged interior finish components. A sustainable building will be recognized as much by the integration of the various environmental strategies it uses, as by the strategies themselves. This integration requires architects, engineers and all other involved in the production of buildings to transcend their professional boundaries and work as a team from the outset. The C-2000 program has already demonstrated that such changes in the design process result both in improved building performance and cost savings, and these benefits will most probably be even greater when extended to a broader range of environmental issues beyond energy. Buildings currently rely on a single throughput of resources. Potable water, for example, is used once and discharged directly as waste through the sewer. Energy is supplied, typically in a high grade form, and dissipated as waste. Materials are used once and then sent to the landfill. Buildings should be designed to draw the most use out of every resource in a cascading effect, from their highest quality upon supply, until they leave the building. Martin Liefhebber’s winning entry to the CMHC Healthy Housing Competition (CA May 1992) now under construction in Toronto has rainwater collection, filtering, purification and storage for drinking and washing by the occupants. This water can then be recycled for dish washing and toilet use, and the resulting waste is filtered and biologically treated on sit. Clean water enters and clean water leaves. Architects must develop new skills, knowledge and attitudes to support both environmental and renovation issues. Yes, there is a proliferation of environmental information. Yes, the quality of information is improving as are mechanisms for finding one’s way through the sheer amount of it. And No, we will never find the right information, at the right time, to make the best possible environmental choice. But there is simply no excuse for inaction. Canadian Architect. The article appeared in the July 1996 issue of the magazine. As in any truly green building project, collaboration between all the consultants from the beginning was vital, since the work of each discipline affects another. Design charettes were held with the university administration, users and all the consultants making a contribution, and gradually the building began to take shape as a long, 30,000 s.f. structure, dominated by a series of swooping metal roofs and with a many-windowed brick facade. Five atria below the curved roofs create a stack effect for natural ventilation. Air enters through operable windows and fresh air vents, rises and is carried up and out of louvers near the roof. The building relies entirely on this natural ventilation for cooling, with just a few fans to help push the air. 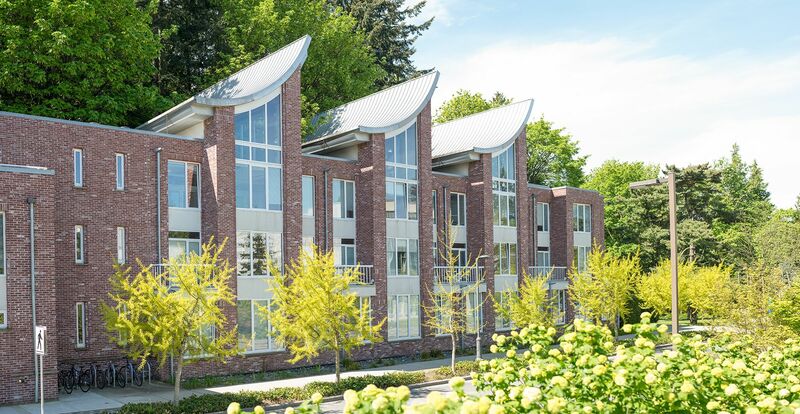 The atria, windows and narrow floor plan also ensure that the building has large amounts of daylight, reducing the need for artificial lighting. Heat in winter is provided by the campus steam plant. About 50 per cent of the materials in the building were reused or recycled. Heavy timbers were brought in from the nearby demolished Armouries building, and the cladding is reused red brick. Composting toilets enable the building to be disconnected from the campus sewer system, and save 1,500 gallons of potable water per day.